Before a congregation is likely to enter into true worship, the church’s leaders must be very clear as to what worship means (concept) and how to achieve a worshipful state (practice). If the intent is to usher people into God’s presence, this often demands that the leaders of the ministry re-conceptualize the meaning and purpose of worship; re-engineer how worship events are designed and conducted; and implement a simple, but reliable method of evaluating what has transpired at the worship event. Why Does the Church Stay Indoors? Why does the Church stay indoors? They have a theology that has dwindled into a philosophy, in which there is no thrill of faith, no terror of doom and no concern for souls. Unbelief has put out the fires of passion, and worldliness garlands the altar of sacrifice with the tawdry glitter of unreality. The Holy Spirit cannot conquer the world with unbelief, nor can He save the world with a worldly Church. He calls for a crusade, a campaign, and an adventure of saving passion. For this enterprise He wants a separated, sanctified and sacrificial people. It has been a week of contrasts weather-wise this week here in the Shenandoah Valley. Last Sunday night it was snowing like crazy. By mid-week, we had shorts and t-shirts on and this weekend has been crazy windy and colder. All that changes tomorrow when it goes back to being spring-like. The ten day forecast looks nice with several chances of rain. The chances of us getting any significant snow are becoming less and less. Apparently we are going to have an early spring. This has been a tough week on the fitness front. Last Saturday I injured my ankle. I have been limping around for most of the week, although I’ve had some minor success running. My total miles is way down for the week. If everything feels good, I may go out for an easy run tomorrow. I can wait to lose some pounds again. I’ve bumped back to 195 at the moment, but as soon as I start gaining some mileage the 5 pounds I’ve gained back will disappear. When I run, my appetite isn’t as strong. We had a great night last night celebrating marriage at our church. It was a great time as we had a sweetheart dinner — great food, great fellowship, and some great fun. We had another great worship service today. The music was great – the praise team did a great job. We were also enlightened about a great compassionate ministry in our city – Valley Mission. We have supported them for several years and I was impressed by their presentation today. Pam taught a children’s sermon during worship and our lead pastor preached a great message from the book of Job. Slowly our house is filling up as Anna is home from spring break. Michael and Rebecca will be headed this way tomorrow. It will be good to have all the “kids” home. I look forward to this week. Praying that you have a great week. Interesting article here from the pen of Steve Brown via http://www.worship.com. I encourage you to check out the bolded part – it’s quite convicting. 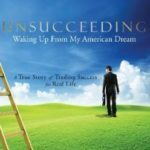 I started thinking about this because a friend of a friend asked me to write the foreword to a book by Kyle Drake, Unsucceeding: Waking up From My American Dream. I liked it. It’s about a man who had everything and decided he was listening to the wrong voices. So, he decided to only listen to the voice of Jesus, to trust him, and to see what happened. The man resigned from his job, and then allowed Jesus to deal the cards and determine the rules of the game. His story wasn’t manipulative, self-righteous or guilt-producing. In fact, he was quite honest in both the successful and less than successful places. The season of Lent has not been well observed in much of evangelical Christianity, largely because it was associated with “high church” liturgical worship that some churches were eager to reject. However, much of the background of evangelical Christianity, for example the heritage of John Wesley, was very “high church.” Many of the churches that had originally rejected more formal and deliberate liturgy are now recovering aspects of a larger Christian tradition as a means to refocus on spirituality in a culture that is increasingly secular. Originating in the fourth century of the church, the season of Lent spans 40 weekdays beginning on Ash Wednesday and climaxing during Holy Week with Holy Thursday (Maundy Thursday), Good Friday, and concluding Saturday before Easter. Originally, Lent was the time of preparation for those who were to be baptized, a time of concentrated study and prayer before their baptism at the Easter Vigil, the celebration of the Resurrection of the Lord early on Easter Sunday. But since these new members were to be received into a living community of Faith, the entire community was called to preparation. Also, this was the time when those who had been separated from the Church would prepare to rejoin the community. Today, Lent is marked by a time of prayer and preparation to celebrate Easter. Since Sundays celebrate the resurrection of Jesus, the six Sundays that occur during Lent are not counted as part of the 40 days of Lent, and are referred to as the Sundays in Lent. The number 40 is connected with many biblical events, but especially with the forty days Jesus spent in the wilderness preparing for His ministry by facing the temptations that could lead him to abandon his mission and calling. Christians today use this period of time for introspection, self examination, and repentance. This season of the year is equal only to the Season of Advent in importance in the Christian year, and is part of the second major grouping of Christian festivals and sacred time that includes Holy Week, Easter, and Pentecost. Lent has traditionally been marked by penitential prayer, fasting, and almsgiving. Some churches today still observe a rigid schedule of fasting on certain days during Lent, especially the giving up of meat, alcohol, sweets, and other types of food. Other traditions do not place as great an emphasis on fasting, but focus on charitable deeds, especially helping those in physical need with food and clothing, or simply the giving of money to charities. Most Christian churches that observe Lent at all focus on it as a time of prayer, especially penance, repenting for failures and sin as a way to focus on the need for God’s grace. It is really a preparation to celebrate God’s marvelous redemption at Easter, and the resurrected life that we live, and hope for, as Christians.